Bill & Gladys celebrated 70 years of marriage on Boxing Day. That is a platinum anniversary and a rare event. 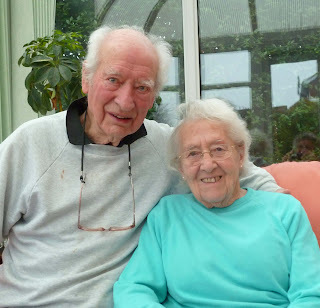 In January 2013 they both reached 96 years of age and a surprise party to celebrate both their platinum anniversary and their birthdays was laid on by some of their many friends at the Ponteland Golf Club where they have both been members for years. Gladys is a former President of the ladies section. Although no longer playing golf they are still active in the local Rotary Club and Inner Wheel. Bill & Gladys came northto Ponteland from London in 1967 with Bill’s job which was to oversee the publicity for the merger of the Reyrolle and Parsons engineering firms. They have never wanted to move back south. Together they have enjoyed a very active life, not only playing several sports but walking and hill climbing, with memories of trips overseas to Nepal, Peru and Africa to name only a few of their destinations. Of course the Lake District was also a favourite. They have a daughter in Oxford and a son in Vancouver as well as five grandchildren and two great grandchildren, and only wish that they were a little nearer!